Have you always dreamed of a unique and unforgettable beach location for your Italy destination wedding? 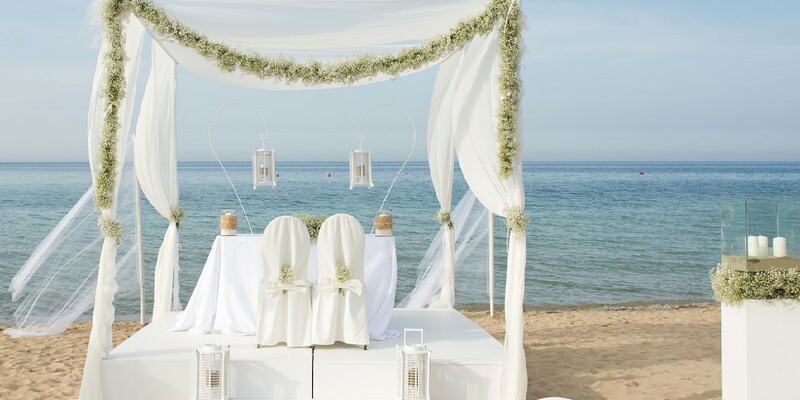 Have you imagined surprising your guests on a white sandy or rocky beaches alon the Italian coast?Stop dreaming and start to plan your special wedding with us. We propose in this page only few example of beach venues in Italy, but are pleased to rganize your wedding in Italy whatever is your choise. In some beaches in Italy you can have apart from the symboli, also the civil ceremony and the wedding reception. The Coccaro Beach Club, unique in Apulia, among the 10 best beach clubs of the Mediterranean, is an exclusive location for weddings on the sea. A world suspended between sea and shore: a combination of grace and bliss, tradition and comfort, together creating an unforgettable event. Is a magical location in Apulia, perfect for elegant receptions on the sea, in a refined, modern environment, where the excellent quality of the service will not fail you. A beach venue where you can celebrate either a civil or symbolic ritual, and where you can organize before and after wedding events. Get married on the beach of the smallest town of Italy, Atrani! A jewel on Amalfi Coast that could become the perfect wedding venue for your wedding in Italy. Few km from Ravello, Positano and Amalfi this beautifulvillage will be givelet you live a unique experience in Amalfi Coast.